On 16th April 2014, IAIP’s Mumbai Chapter organized this Training Event, under the auspices of Bloomberg India. 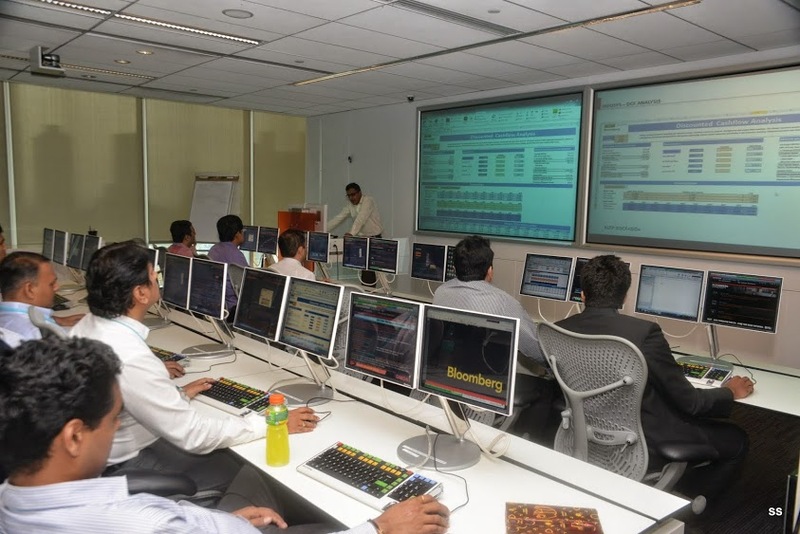 The trainer for the event was Puneet Saxena, Equities Specialist, from Bloomberg India. Puneet started by introducing himself and explaining ground rules for participants. He also gave a brief overview of the agenda- namely to discuss the workflow of Equity Analysts before, during and after Earnings are declared. The stock selected for analysis was IT bellwether Infosys Technologies (INFO). He fielded some incisive questions from members of the audience. Jayna Gandhi, CFA presented Puneet with a token of appreciation and delivered the Vote of Thanks. The event was well received by the appreciative audience. Some of the tools are reproduced here. Puneet referred to a recent news story on Infosys, wherein the CEO issued a pessimistic outlook on sales guidance. Immediately the stock fell by 7.5%, in reaction to the muted guidance. Puneet then pulled up a 2-year historical chart of Infosys (INFO), which clearly showed similar hair-trigger responsiveness of share price to previous earnings calls – an example of a “Regular Anomaly”. He then pulled a technical chart of Infosys, which showed that the most recent trend was bearish giving a Sell Signal. Next he pulled the DCF Analysis, which clearly showed that the stock was trading at a sizeable discount to its Intrinsic Value, as measured by Terminal EBITDA Multiple method. Thus DCF gave a Buy Signal for the stock. Next he switched to Relative Valuation (RV), for which the critical success factor lies in selecting a relevant set of peer group companies. On Bloomberg, this can be effectively accomplished using Equity Screening command, and adding appropriate filtering criteria. Puneet showed how to save the results and use them for making appropriate comparisons. The same RV results can be used to value the stock relative to Historical Multiples. On both counts, a Buy Signal was generated through RV. Finally, the various Analyst Recommendations (ANR) were highlighted, along with target price, date and expected 1-year return. From these, the consensus ratings were generated. For Infosys, more than 2 out of 3 analysts rated the stock as a Buy, with average return potential greater than 20%. Thus ANR gave a Buy Signal. Next, Puneet showed how to access Institutional Holdings of INFO stock relative to its peers using the OWN command. Historically, INFO has always had one of the largest cash holdings in Indian industry, coupled with a low dividend yield. The best option would be to buy other companies, paying cash for an accretive acquisition. Again the versatility of the software was on display, as Puneet showed how to analyze Merger opportunities, playing around with assumptions for deal terms, synergies, etc for both the target and the acquirer. The topmost priority for an analyst is to track the earnings event as it unfolds. Bloomberg provides an Earnings Monitor, which tracks Earnings in real time. Besides the live events, one can access call transcripts, recordings, press releases and earnings reports. There are also features to track earnings estimates and compare reported versus estimated numbers. The entire earnings revision history of a company is at the analyst’s fingertips on Bloomberg, as are the overviews for consensus estimates and company guidance. Finally the discussion switched to the 5-ton elephant in the room, namely the impact of General Election 2014 on the stock markets. Puneet said that small and midcap stocks have outperformed large caps substantially over 2-year periods following both previous elections. Hence he claimed that midcaps and small caps are the best investment picks from the election perspective. Finally he used Equity Screening to select midcap companies having high Interest Expense, and stated that these firms would benefit from attractive sops as and when the new government comes to power at the Centre. This entry was posted in Events, Mumbai, Speaker Events and tagged Bloomberg, IAIP, Indian Association of Investment Professionals, Infosys, Ishwar Chidambaram CFA, Jayna Gandhi CFA, Puneet Saxena. Bookmark the permalink.